In case you didn’t already hear, this weekend is going to be huge for college basketball. It is coming down to the wire, with only 9 days left until selection Sunday. Some teams need a nice boost while others look to hold on to their number 1 seeds while playing other ranked teams. *Click on any blue links below to see a small preview about their team! Now I usually don’t believe that the number 1 seed is always the best team, but in this case it’s hard to against Kentucky. Especially with the way they went off against Georgia during their senior night on Thursday. I really feel like they are the toughest team in the league and should run right over Florida. 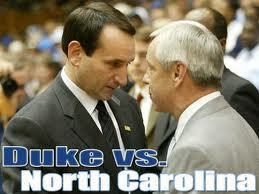 UNC and Duke is going to be the game of the year. After their last game, which was like an NBA game, you can expect the very best from both teams. This entry was posted in College and tagged acc, barnes, baylor, Big East, Blue Devils, boston sports blog, college, Davis, division 1, duke, Indiana, kansas, kentucky, louisville, march madness, mens basketball, Michigan State, missouri, mizzou, NCAA, north carolina, Ohio State, robinson, sullinger, syracuse, tarheels, UNC, unlv, zeller by christoph131. Bookmark the permalink.